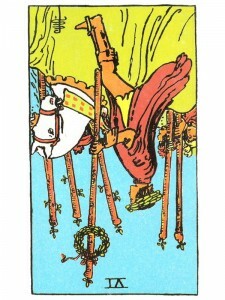 Six of Wands (R) says false optimism – trying to cover your doubts will only lead to more fear, insecurity, possessiveness and weakness. When things are not happening the way you want them to – do not allow the tension and pressure to build, for it will produce a defeatist attitude – the sense that you are being overwhelmed by the enemy or that people will betray you. This attitude can become a self – fulfilling prophecy – suspicion produces betrayal. Use your creativity and flexibility to achieve the ultimate victory – the victory which provides a win-win situation and allows for “mutual” unfolding and opening – for new energy and revitalization, for clarity of vision and creative expression, experienced mentally, emotionally, spiritually and physically. Blame for something done wrong. Difficulty with pride and the dangers of success – a need to guard against self-righteousness. Here, in a distortion of this archetype, is the missionary going forth to convert an indigenous people whose native religion is purer than the missionary’s. As we stretch our spiritual muscle and extend into larger and larger worlds of awareness, we are meant to seek others, those of related paths with similar karmic purpose, but to do so all we need do is witness our beliefs and we will be mutually attractive to our kindred spirits. There is never a need to convert. In the first position: Be ready, for it is you who are most likely to be converted in this lifetime. In the third position: You are probably not feeling the degree to which you have advanced and this reading is meant to reassure you. Persevere. In the fourth position: To lust after the path as a mission to be fulfilled, with conquests to be made, is a path with many forks that lead to dead ends. In the fifth position: Be reminded that you must listen to a wider audience as you increase your activity and scope. In the sixth position: With this test we are meant to carry all of our loved ones with us fully in our hearts, leaving nothing behind. This path is to add to, not to replace. In the seventh position: Do not let fear paralyze you into non-action. Expose and promote your beliefs and they will propel you forward. In the ninth position: At one extreme, the heart is not into this campaign, not yet willing to give up the intimacy of the existing inner circle, the present family. At the other extreme, the heart is much too hungry for new blood to flow through the collective veins of your extended family. In the tenth position: Grace will help you find the courage.